Yesterday University of Sydney held an open day. I took the opportunity to join a tour of the Charles Perkins Centre and its X-lab. The building has space for 1500 undergraduates, 900 medical researchers, and higher degree students. One feature of the building is the way the undergraduates can mingle with researchers and medical doctors. 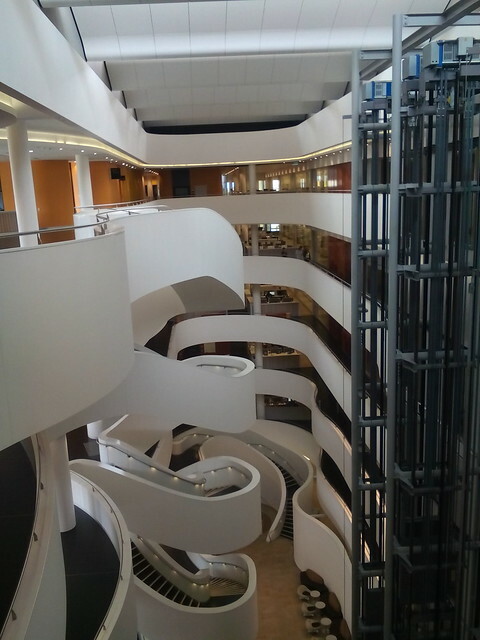 The building has an atrium with curved balconies and a sinuous staircase offering an alternative to the lifts. There is the usual modern layout with open plan in the middle and meeting rooms around the outside, with glass walls. The standout feature is the "X-lab wet lab". 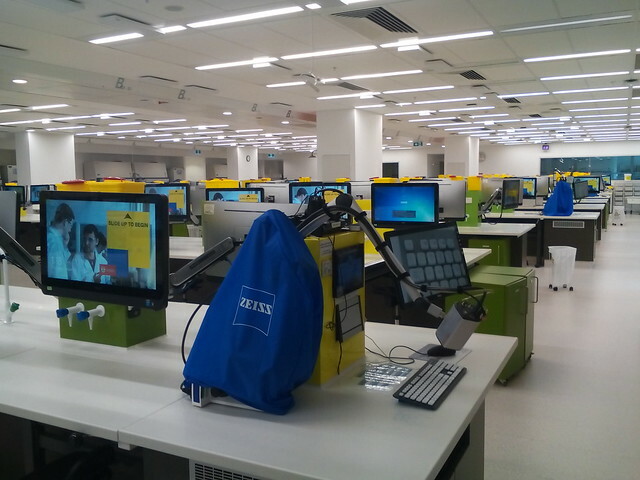 This has rows of lab benches, with each of 240 students getting a touch screen computer on an arm. Four instructor stations are equipped with cameras so the students can see their instructor, and the experiment they are performing close up on screen. There are directional loudspeakers in the ceilings above the benches, to allow students to listen to one of the four instructors. The x-lab provides an advanced teaching environment, but is not perfect. The directional speakers work well enough, but are an expensive solution. A lower cost alternative would be to divide the room into four zones, with a row of equipment cabinets separating the zones. Low cost loudspeakers (or the speakers in the computers) in each zone would then have provided adequate sound separation. Alternatively headphones could be used, which would also allow the students to speak to the instructor: a technique I have dubbed the "silent lecture". The DELL touchscreen computers, at about 36 inch, are somewhat oversize and tend to dominate the room. Smaller touch screens, of around 15 inch, might be more suitable (and cheaper). The operator consoles at the ends of the benches are well equipped, but the screens here are also large and make the instructor hard to see. It might be useful to have the instructors station raised and smaller screens used. The building also has "dry" teaching rooms, with a microscope for each student and a large computer monitor. There are also conventional teaching rooms and informal group spaces for students. A surprise is that under the entrance to the building is a very large lecture theater. This is a good use of space, as a lecture theater d does not require a view and so can be placed underground.